Dull knives make cutting a difficult chore. They are also dangerous and hard to control. 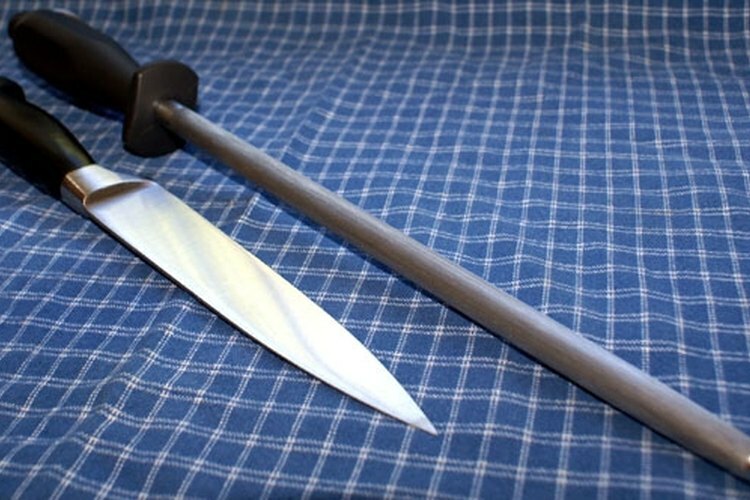 Keep your knives sharp and ready with a sharpening rod, also known as a steel. A steel is a specially made metal rod with a handle. It has a textured surface like an emery board or a fine rasp. You can find steels at any store where knives are sold. Hold the sharpening rod with your left hand (if right handed), keeping your fingers on the handle. Direct the rod away from your body. Firmly grip your knife your other hand. Be sure to keep your fingers away from the blade. Place the blade near the handle of the sharpening rod at a 20-degree angle to the surface. Slide the blade across the steel like you are cutting a thin slice off the steel. Sweep the entire length of the blade from handle to point. Turn the knife over to sharpen the opposite side, pulling the knife toward you. Repeat Steps 4 and 5, sharping each side of the blade equal times. Six to 10 strokes per side is usually enough. Test your knife for sharpness by slicing the edge of a piece of paper. A well sharpened blade will cut into the edge with ease. Use the sharpening rod before each cutting job to keep your knife from getting dull. Be aware of your surroundings; never use a knife where you can accidentally cut another person.